I’m not particularly religious, but even I know this is absolutely ridiculous. The Social Justice Warrior culture has just gone way too darn far and now even the churches are starting to succumb to its influence. In Sweden, Lutherans are imploring their clergy to use gender-neutral terms in reference to God and using terms like “the Lord” and “He” aren’t going to cut it anymore. If you’re pinching the bridge of your nose right now in a desperate attempt to stave off the impending headache of reading the rest of this article and voluntarily exposing yourself to such idiocy, I’m right there with you. The entire handbook has been updated to include the new language parameters that dictate exactly how hymns, liturgy and language should be conducted during services. This will officially take effect on May 20th, on the Christian holiday of Pentecost. 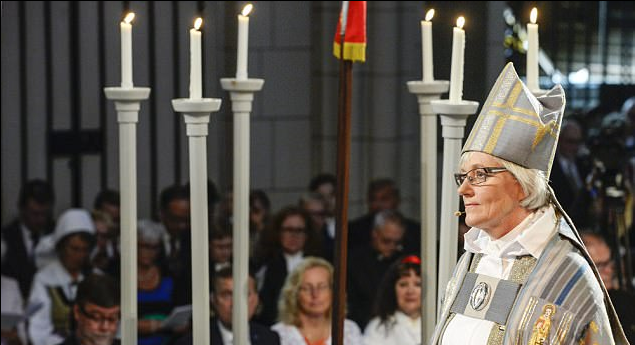 “Theologically, for instance, we know that God is beyond our gender determinations, God is not human,” said Archbishop Antje Jackelen, who heads the state church. Even with that being the case, God has been referred to as “the Lord” and “He” since the religion was established. You are literally going against thousands of years of history for the sake of liberal talking points. If this decision had come about in good faith, as the result of a theological conversation that included everyone within the religion, that would be one thing. But with the current climate being what it is, this determination is super suspect. Naturally, this change isn’t being embraced by everyone. “It really isn’t smart if the Church of Sweden becomes known as a church that does not respect the common theology heritage,” said Christer Pahlmblad, an associate theology professor with Sweden’s Lund University. How would you react if your church began urging you to use gender-neutral terms for God during your service? Let us know in the comments! I can assure you that this would not go over well in the United States, especially among church-going conservatives who are sick of progressives attempting to change anything they can get their grubby little paws on.